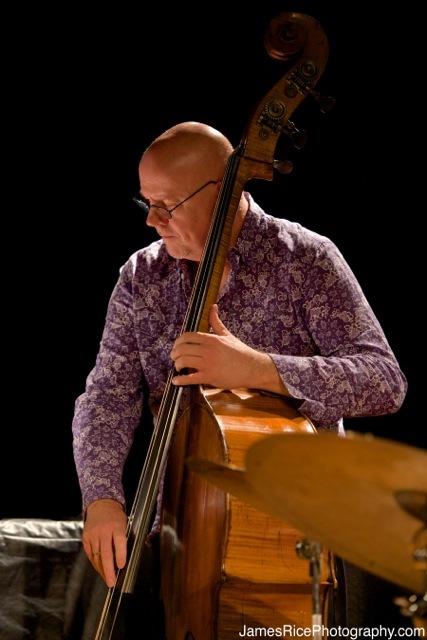 Bassist/composer Jay Anderson is among the most versatile and respected jazz artists performing today. He has performed/recorded with a wide range of jazz artists including Woody Herman, Carmen McRae, Michael Brecker, Paul Bley, Bob Mintzer, John Abercrombie, Dave Liebman, Joe Sample, Maria Schneider, Stanley Cowell, John Scofield, Lee Konitz, Vic Juris, Red Rodney, Ira Sullivan, Mike Stern, Anat Cohen, Toots Thielemans, Kenny Wheeler, Jay Clayton and non-jazz artists like Oswaldo Golijov, Dawn Upshaw, The Australian Chamber Orchestra, Robert Spano (Atlanta Symphony), Michael Franks, David Bowie, Frank Zappa, Tom Waits, Terre Roche, Chaka Khan, Michel Legrand, Allen Ginsberg, and Celine Dion. He has been featured on over 400 recordings, seven of which have received the Grammy Award . He has conducted clinics around the world and is a Professor of Jazz Bass Studies at the Manhattan School of Music in New York City. Jay currently co-leads the critically acclaimed group BANN featuring Seamus Blake, Oz Noy and Adam Nussbaum.